10 Facts about the big fat Nickyanka Wedding that will leave you stunned! Their wedding was all about love and here’s telling you there’s so much you don't know about it. So scroll down to know all the minor deets about the Nickyanka wedding which noone will tell you about! PS: keep your tissue boxes ready! Priyanka had the team at Ralph Lauren hand-stitch eight words and phrases on to the gown. 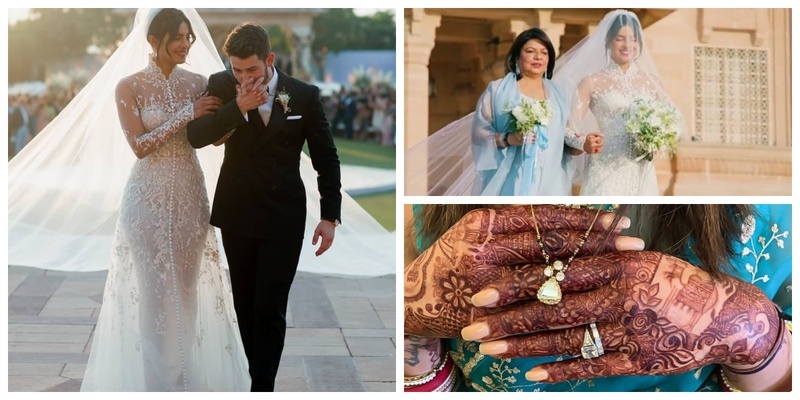 She had them sew Nick's full name - ‘Nicholas Jerry Jonas’, their wedding date and the names of her parents - ‘Madhu’ & ‘Ashok’ sewn to the dress. ...and so was her lehenga. PC had a piece of her mother-in-law’s lace wedding dress sewn into her dress. Underneath the long-sleeve gown was a strapless column dress made up of 2,380,000 mother of pearl sequins. Chopra completed her look with long tulle veil that reached 75 feet and custom Jimmy Choo shoes. On top of her right hand she included a guitar which is a sweet not to her musician hubby. The bride wanted something elegant, romantic, delicate and contemporary yet timeless as her bridal bouquet. So the couple flew their favourite florist Jenya Tsybulskiy all the way from New York and these are the flowers that made to the final bouquet - nerine, Salvadora Perl berries and tuberose - PC's mom's favorite.